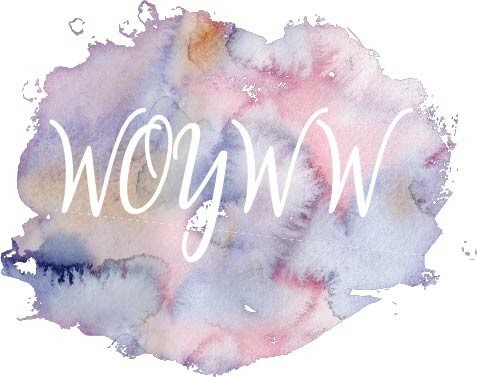 Not long now until the WOYWW tenth anniversary crop - we've made our travel plans and are looking forward to seeing everyone again. Hope you are going to be there. 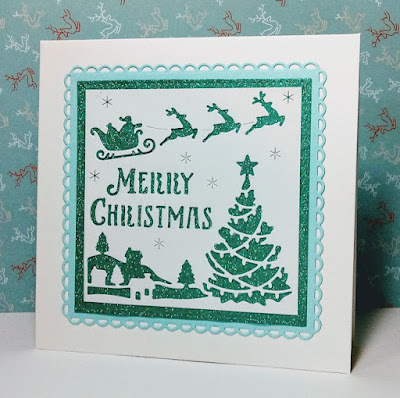 More details on Julia's blog, the Stamping Ground, in this post. Now, on to what's on my Whizzday desk today. It's the post cyber crop desk and it's a such a mess I can't bear to talk about it. I haven't had time to clear it up yet. I won't go into details of what exactly is in that pile on top of the desk and hopefully there's no need for an explanation of what's in the trolley! And here's why everything is still so messy today. 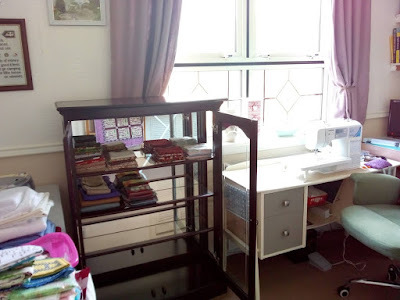 We have converted what was a spare bedroom into a combination of sewing/music room and this morning our two fit and strong grandsons came round to give us a hand. They lifted our old, but very heavy, china cabinet upstairs into the room so that I can use it for storing fabric. As you can see, I've made a start but it's going to take time. I'm in no hurry. Under that pile of fabric you can see to the left is a new cutting table. I'm feeling truly spoiled to have so much space, equipment and storage. And the light from the window makes it perfect for sewing - these old eyes are not as sharp as they used to be. I thought I'd let you see the sampler that's only partly visible in the above shot. 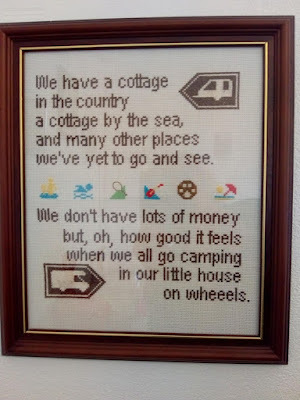 It was stitched for us many years ago by my daughter. We had a touring caravan back then and went all over the UK and Ireland with it. 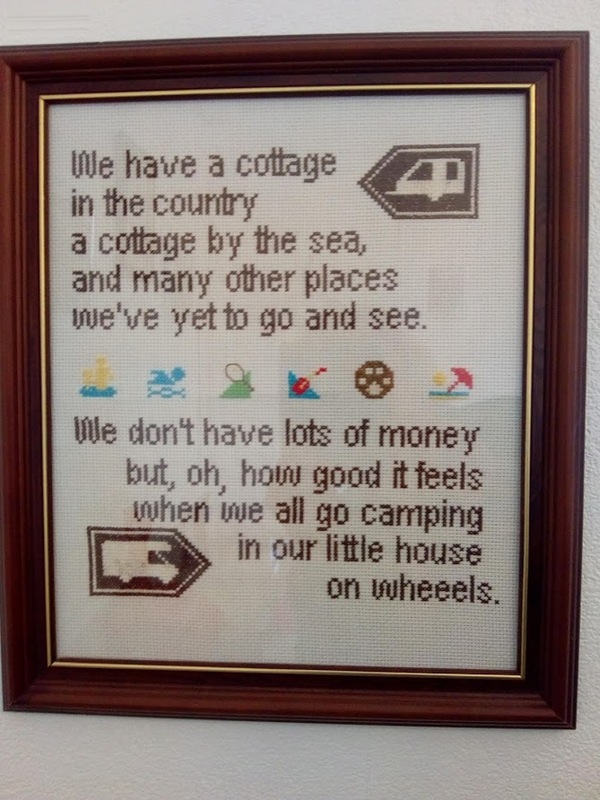 Although we no longer have a caravan we enjoy having the sampler as a reminder of all the fun we had in it. And finally, the book bit. 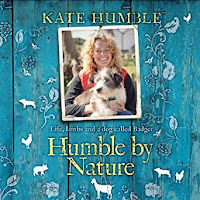 Two books written by Kate Humble, the well-known presenter of wildlife and nature shows. 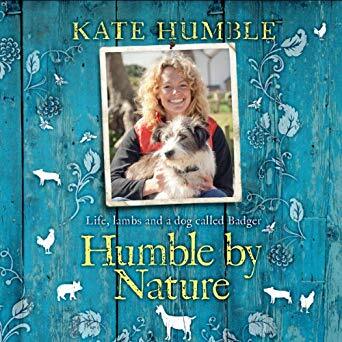 'Humble by Nature' is Kate's account of her and her husband's move to a smallholding in the Wye Valley after living for twenty years in London. It's a really good read describing the problems they encountered with converting and refurbishing buildings, the buying and rescuing of animals, the sowing of a wildflower meadow and the setting up of classes for other smallholders. They also rescued another farm from being split up and sold off by the council. Altogether a very heartwarming story. 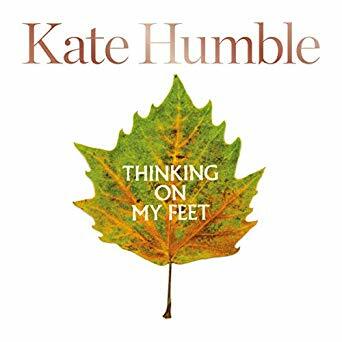 'Thinking on my Feet' is a journal about walking, in particular the joys, and the benefits, of walking every day. Even a short walk does you good. 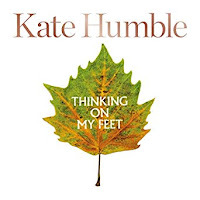 This is an inspiring book and I lived the Wye Valley Walk vicariously with Kate. 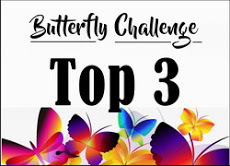 Through her we meet other walkers, in particular a memorable woman who walked every footpath in Wales (3,700 miles) when she discovered she had cancer. Awe-inspiring. I'd like to say I'm off for a walk now but not so. 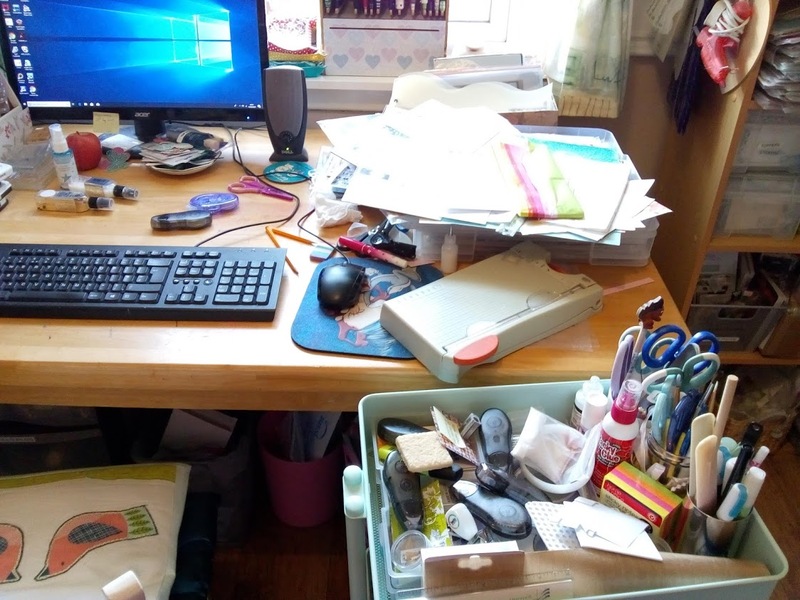 I have a lot of desks to visit instead and there's a pile of fabric in the sewing room just waiting for me to sort out into neat little piles. And that's not to mention the mess just beside me that's waiting to be put away. That's it for today. Until our next Whizzday, I wish you all a wonderfully crafty week. Back again with two more pages made today. This photo is of my grandson playing football on a very unseasonably cold, miserable, day in July 2015, hence the title. I pulled out several punches and a set of circle dies to create all those circles. 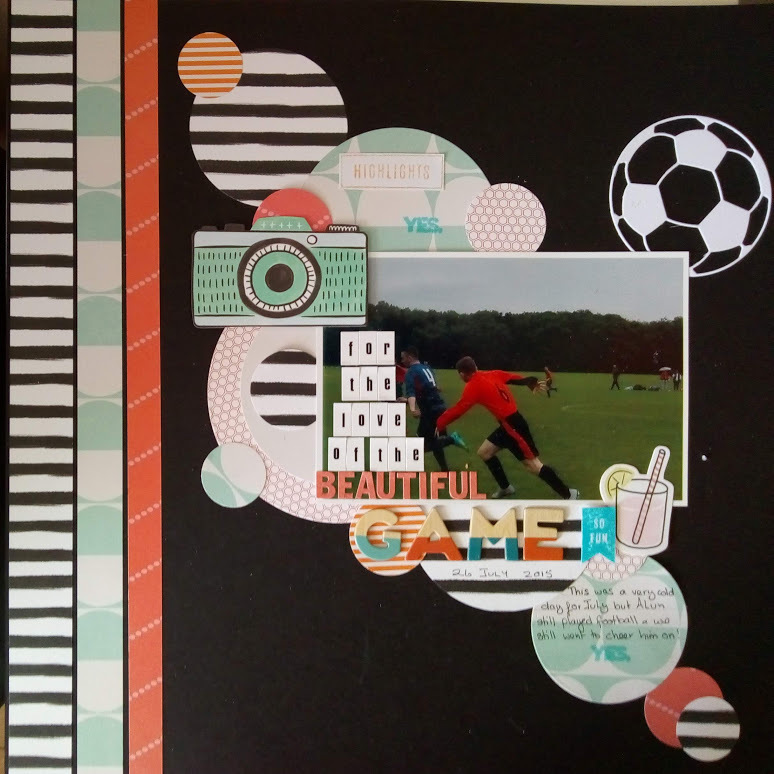 Supplies used are mostly from Mind the Scrap's kit for March - patterned papers are from Dear Lizzy, Maggie Holmes and Paige Evans; embellishments Amy Tangerine and alphas from American Crafts Marquee thickers and Kesi'art Script stickers - the orange letters are from old stash. 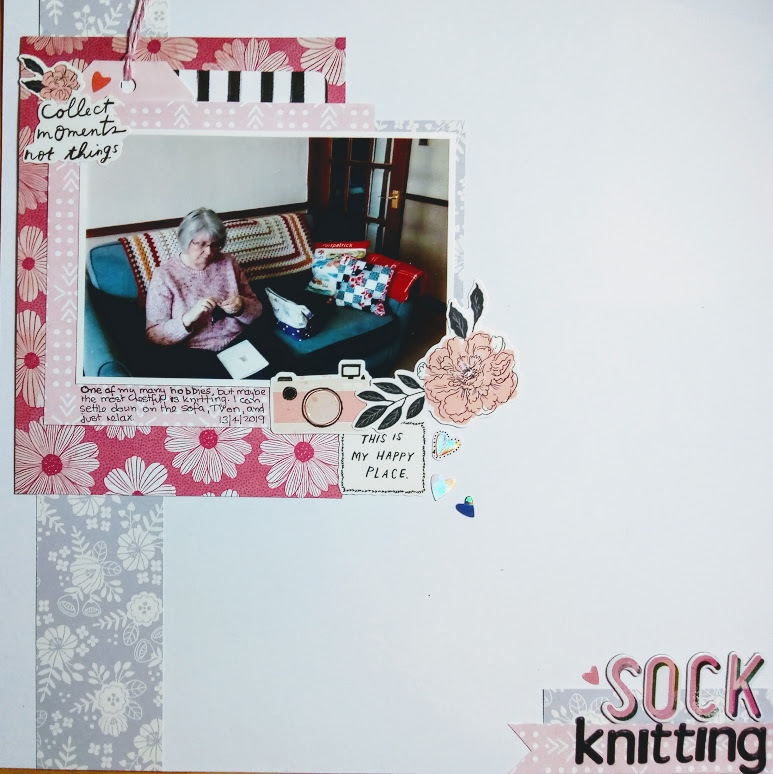 I don't usually do this but I posed for this photo earlier on today so that I could make a layout to record my sock knitting. Again the supplies used are mostly from the March kit with a few from older kits included. 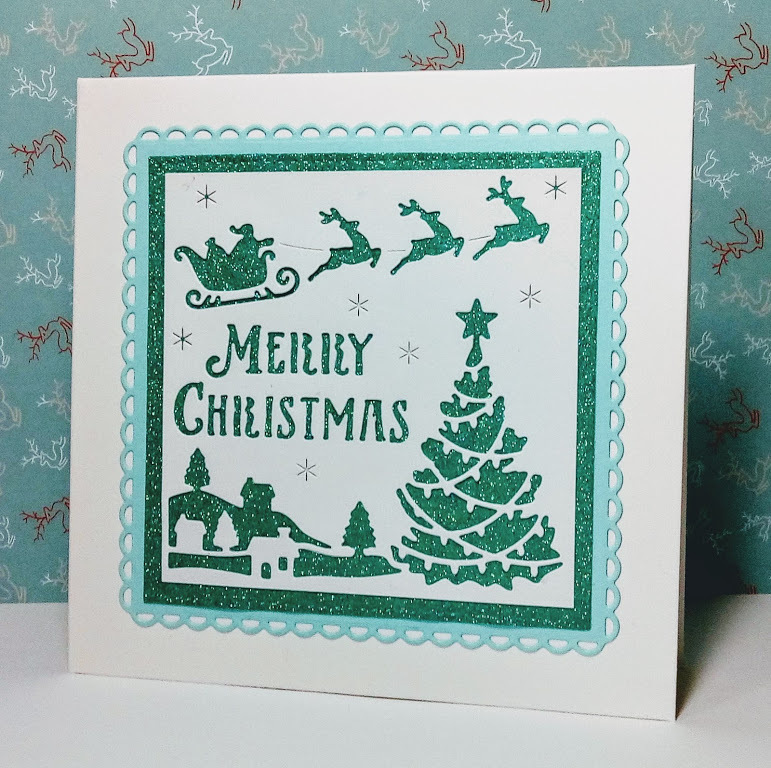 Patterned papers - Jen Hadfield and Dear Lizzy; die-cut embellishments from Amy Tangerine and stickers from Maggie Holmes; alphabet thickers are American Craft Charming and The Works black puffy stickers. I can't pretend I'm making good progress - in fact, I'm way behind - but as the EM says 'it's not the winning that counts, it's the taking part'. It's fun and at the end of the weekend I will have a few more scrapbook layouts for the albums. I'm off to bed now. Hoping to be up early, wide-eyed and bushy-tailed, ready to create a few more pages. I wish you all a super Sunday whatever you're doing..